Well, on the bright side, they look great! I love the third photo. I love them! Such bright, happy socks. 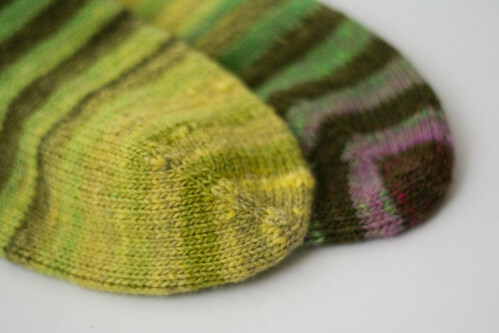 I have really got to make myself some of these Noro striped socks. Yours are amazing!! I love how the colors worked out with super contrasting stripes in some places and less defined in others, but always there. Great color! Love that they don't match! I love the unmatchiness of them! 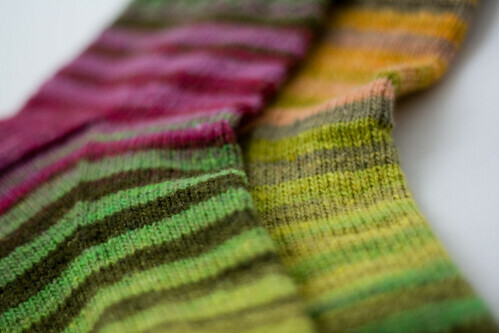 And I find stockinette socks SO boring -- it took me over a year to finish my only pair. But one with a pattern of some sort go much, much faster. i love these socks! so simple yet complex at the same time. I feel the same way about socks, but that hasn't stopped me from stashing up sock yarn! 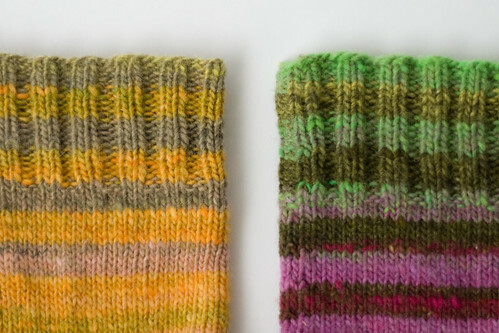 I have some Noro in there too--maybe I'll pull it out and give it a go. 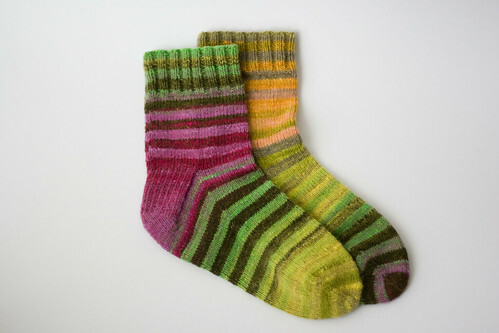 if only i didn't still have so much wool i could go and buy some noro... but i still wouldn't have time to knit something so intricate as socks. maybe i will take a photo of most of the socks my mum knitted for me and the husband, i washed almost all of them the other day! PS my mum actually likes the stocking stitch monotony! I'm not the best at catching up on blog posts, but I did read the one before this and wanted to commend you, or rather, have a common thread with you, regarding stashing. I have a relatively small stash as knitters go, as well - I don't buy much unless I know I've got a project in mind for it, or I know I'll want to use it soon. So, yay - rare breeds are us! Hi -- Just came across your post (sept '05) about organizing fabrics with comic book boards; I was searching for help on how to control my stash!. But comments were closed so came to your main page and wow, what beautiful socks! Just the things I DIDN'T need to see : ) -- I been contemplating learning to knit but really shouldn't add one more "craft" to my life. But seeing your socks just might push me over the edge. P.S. Love your photos too, not just on this post, but throughout your blog. And your box bags, etc, are beautifully done. I'm with ya on the handmade vs. homemade look! Rainbow shade. I really love the rainbow shaded socks. Kind of fan of them.